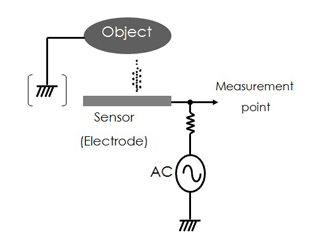 The Electrical Field, or EF technology is a low cost sensing technology. The system works by emitting a very low level electrical field. When a person enters the electric field (sits in the seat) a change in the field occurs. This change is measured and processed by the control unit to make various judgments; In this case, whether to enable or suppress an airbag. The Nidec Elesys Occupant Detection System (ODS) is based on our EF technology. The system is composed of a single-layered, flexible sensor assembly that is thin, yet durable, and very easy to configure. 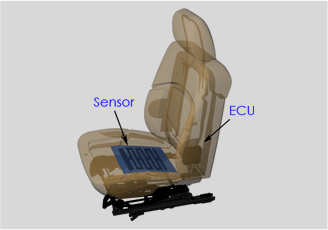 The sensor assembly is installed in the bottom cushion of the passenger seat and is used to suppress or enable the passenger's airbag based on the classification of the occupant. Nidec Elesys? EF technology provides a low cost alternative to classification between varying size passengers for low risk airbag deployment technology. The Nidec Elesys system fulfills the requirements set forth by FMVSS 208 issued by the National Highway Traffic Safety Administration in the United States. Unlike seat weight sensors or bladder sensors, our occupant detection technology is not affected by weight, seat belt tension, or movement of the passenger. Furthermore, the system will not be triggered by inanimate objects placed on the seat. 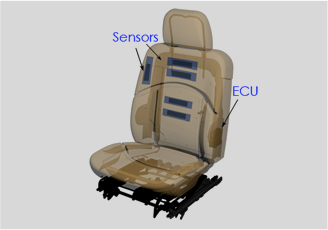 The Occupant Position Detection Systems (OPDS) utilizes the same EF technology as ODS, but with sensors in the back cushion of the seat. In the event that a child passenger is leaning and getting close to the side airbag, the ECU will suppress the side air bag in order to prevent serious or even fatal injury to the passenger.